A decadent entrée into the World of Neuhaus Authentic Belgian chocolate. 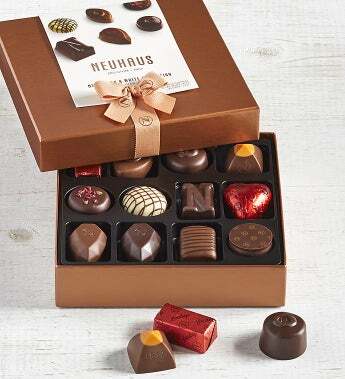 This selection includes 12 timeless Neuhaus chocolates in milk, dark and white filled with pralinés, ganaches and caramels and showcased in a vibrant gift box. A most delicious chocolate assortment to send for any occasion. entirely in Belgium with only the finest ingredients. These fine chocolates are non-GMO and are imported fresh weekly. Gift Measures 7.5" x 7.5" x 1.5"
Ttl Net Wt. 4.87 oz.